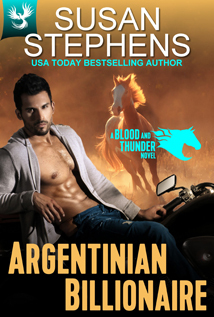 Argentinian Billionaire (Blood and Thunder 2) is the second story in USA Today best-selling author, Susan Stephens' Blood and Thunder polo series. Irish horse whisperer Rose Delaney is employed by the Blood and Thunder polo team to work with their ponies as a sports psychologist might work with an athlete. Team member without a heart, or scrap of conscience, Dante Formosa, son of a Romani mother and aristocratic Argentinian father, can see far more pleasurable uses for the stand-up Irish woman. With no feminine influences in her life, Rose, who grew up on a farm in Ireland with six brothers, is confident she can handle Dante. She works with some of the most challenging horses in the world, and knows no fear... until she's is in danger of losing her heart to the wild Romani with his cold, aristocratic heart. As sexual heat rages between them, trust grows too and Rose learns that Dante is not only a leading polo player, but a vigilante prepared to risk his life to clean up crimes that traditional law enforcement agencies can't handle. When dangerous thugs threaten her father's farm in Ireland, Rose turns to Dante for help, but is she prepared to pay his price? From the sultry heat of Isla Celeste, to Rose's lush green home in Ireland, and on to the wild pampas of Argentina where Dante owns land the size of a small country, they ride hard, fight hard, and love hard, until it's too late for Rose to call her heart back. It's only now she discovers that Dante's double life is not his only secret.